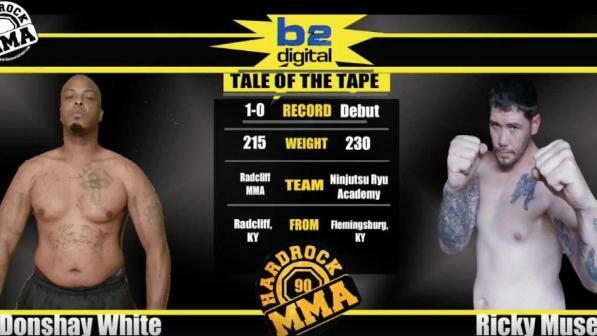 Donshay White was an amateur mixed martial arts (MMA) fighter who passed away right after a bout with Ricky Muse at an MMA event called Hardrock MMA 90. The event took place at the Expo Live in Louisville, Kentucky on July 15, 2017. The two combatants fought on the heavyweight division. White weighed in at two-hundred-fifteen (215) pounds while Muse weighed in at two-hundred-thirty (230) pounds. White was from Radcliff, Kentucky. Muse is from Flemingsburg, Kentucky. White entered the cage with a 1-0 record. His first fight happened in November of 2015, knocking out John Johnson Jr. in the very first round at Hardrock MMA 76. Muse, his opponent was making his MMA debut. According to those who saw the fight, Muse won the fight via technical knockout in the second round. Muse hit White with three to four punches with his ground and pound. Referee Gary Copeland intervened at the 2:22 mark of the second round. White was able to make his way backstage on his own but he eventually collapsed and became unresponsive. He was given CPR (cardiopulmonary resuscitation) before he was quickly transported via ambulance to the KentuckyOne Health Sts. Mary and Elizabeth Hospital. He passed away at the hospital. He was thirty-seven (37) years old. A livestream video of the fight was on YouTube but Hardrock MMA has since taken it down. According to Blue Grass MMA, during the ninth bout in the stacked card, doctors were once again called backstage when another fighter named Kalen Ray collapsed. Ray was given medical attention and rushed to the hospital. With no medical personnel on site, the rest of the card had to be cancelled. There were at least three fights remaining in the card with the main event featuring a professional encounter between Ian Lawler and Branden Bishop.